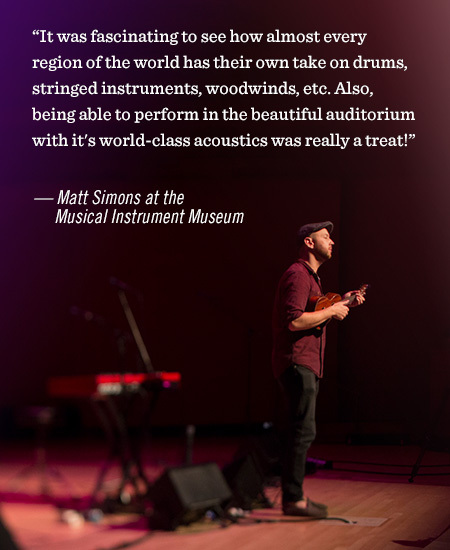 Singer/songwriter, Matt Simons had a chance to explore the world through music at the Musical Instrument Museum (MIM). This unique museum, displays instruments and objects from every country in the world, and is ranked Phoenix’s number one attraction on TripAdvisor® and the fourth Best Museum for Families nationwide by USA Today Travel. Matt was in awe of the expansive collection of more than 6,000 instruments and objects from around the world — all organized into five Geographic Galleries that each focus on a distinct global region. The galleries employ wireless technology and video screens, which enabled Matt to see instruments, hear their sounds and observe them being played in their original settings. Matt particularly liked the Artist Gallery where he was able to see iconic instruments from celebrities like Elvis Presley, John Lennon, Taylor Swift and Carlos Santana. From jazz to classical, bluegrass to singer/songwriters, MIM is an unparalleled venue for enjoying old favorites and experiencing new sounds from around the world. Learn more at https://mim.org/.